Jonathan Hurst arrived in the Expos system in 1991 and he prospered, so much so that he found his way onto the team's 40-man roster. Going into 1992, his sights were set on the actual major league roster in Montreal, he told his hometown paper The Spartanburg Herald-Journal. "I've been in every step I can go in the minor leagues," Hurst told The Herald-Journal. "My goal was to reach the big leagues and stay up there." Hurst did reach the big leagues that year, debuting with Montreal in June. But he didn't stay. He got just three starts for the Expos, then seven relief outings for the Mets two years later. Those eight games were the extent of his big league career. Hurst's professional career began in 1987, taken by the Rangers in the fourth round of the draft out of Spartanburg Methodist College in South Carolina. Hurst started in the rookie Gulf Coast League. In 12 starts, he went 4-3, with a 1.88 ERA. He started 1988 even better, with a 1.64 ERA over 13 outings between the GCL, single-A and one AAA outing. He moved to single-A Port Charlotte for 1989, then Port Charlotte and single-A Gastonia for 1990. He also got his first look at AA Tulsa that year. After his move to the Expos in 1992, Hurst went 5-0 in eight starts, with a 0.86 ERA. For 1992, he started at AAA Indianapolis. By June, he was in the majors. In his three starts for the Expos that year, Hurst went 16.1 innings and gave up 10 earned. 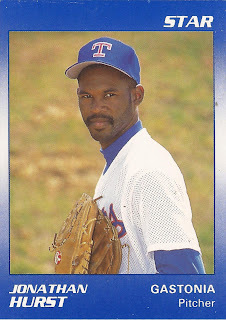 He moved to the Dodgers system and then the Mets for 1994. He actually started 1994 in Flushing, getting into seven contests in relief. In 10 innings, though, he gave up 14 earned. Hurst played the next three seasons in Mexico, then spent a final season in the minors with the Rangers in 1998. But Hurst still played. By 2001, Hurst was in Japan. Hurst got 22 games, two starts, with Yakult, ending with a 5.97 ERA. In 2003, he was in Taiwan playing for the Brother Elephants. He'd played in Taiwan twice before, in 1998 and 2000. "I know I can't pitch forever, so I will try to outthink the hitters more, instead of blowing pitches by them," Hurst told The Taipei Times in June 2003. "Besides not throwing them the pitches they are looking for, location [of the pitch] is everything." By 2007, Hurst had started his new career, coaching. He served as pitching coach of single-A Savannah for two seasons. He moved to the Mets and rookie Kingsport in 2009. He's continued to serve as the rookie club's pitching coach in 2014. In 2008, Hurst looked back on his youth growing up and discovering the game in Spartanburg. "For all I knew," Hurst told The Herald-Journal at his old high school field, "there wasn't professional baseball or the major leagues. When I stepped on this field, I was in heaven. It just went from there."